Update Vista/Win7 drivers for your SAMSUNG notebooks. 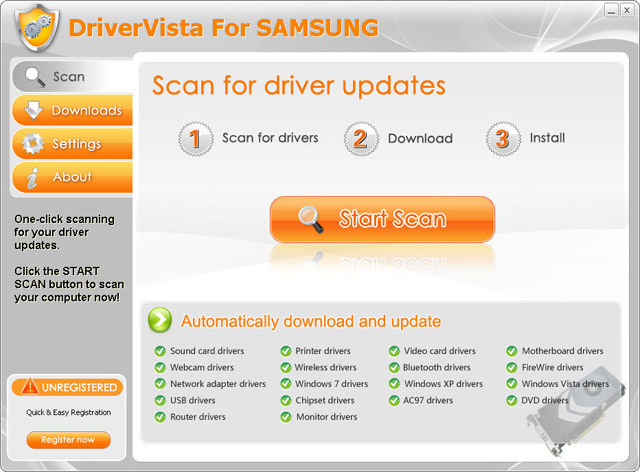 DriverVista For SAMSUNG can help relieve you of worries about installing out-of-date drivers. It scans your system and install SAMSUNG official drivers to your SAMSUNG notebooks automatically. Did you lose the driver disc that came with your SAMSUNG hardware? Is your SAMSUNG device not listed anywhere on the Internet? Are you struggling to find the drivers that will get your SAMSUNG hardware working with your version of Windows? You're not alone! Finding the correct official SAMSUNG driver for your hardware can be a tedious task - especially if you accidentally install the wrong driver and damage your computer. DriverVista For SAMSUNG takes the guesswork out of it by automatically downloading the correct drivers for your SAMSUNG hardware. DriverVista For SAMSUNG has a 100% success rate identifying all SAMSUNG hardware manufactured since 1996. The results from its in-depth scan of your system are compared to DriverVista's massive driver database, giving you the best possible driver for your hardware. Its amazing success at bringing thousands of users drivers for their SAMSUNG hardware is why DriverVista is guaranteed to find the right driver for your system. Download it now and bring your SAMSUNG device back to life! FSS Plagiator - FSS Plagiator is designed specially for students of various educational institutions: schools, colleges, universities, etc. The app uses advanced algorithms for text modifications without visual changes. Driver Genius - Driver Genius manage your PC to get 100% up to date drivers and optimize PC performance. Product Key Explorer - Product Key Explorer is a powerful product key find and product key recovery software for Windows, Microsoft Office, SQL Server, Nero, Adobe CS3,CS4,CS5,CS6 and +8000 other software. It recovers product keys from local or network computers. WinTools.net Classic - Suite of tools for increasing operating system performance. WinTools.net cleanly removes software from disk drives and dead references from the Windows registry. WinTools.net gives you control of start up process and customize system settings. IObit Uninstaller - IObit Uninstaller 8 is a perfect uninstallation tool. It provides an easy and secure way to remove unnecessary programs, Windows apps, Universal Windows Platform (UWP) apps, malicious or Ad plugins, and thoroughly removes all leftovers. VeloRAM - VeloRAM is a block level RAM Cache for any Storage Volumes. It is fast like a RAM Disk. Accelerates even SSDs. Allowing highest IOPS / MBPS scores. Compatibility starts with Windows 7 up to Window 10 Fall Creators Update.